My, don't they look proud. 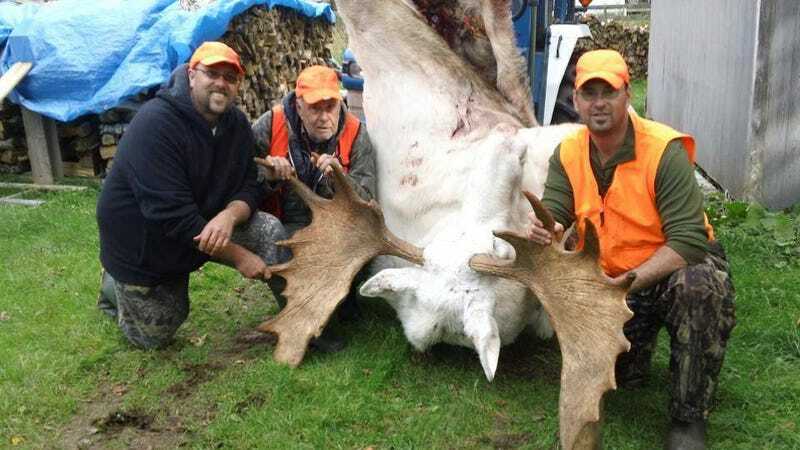 But after shooting this rare albino moose near Belle Cote in Nova Scotia last week — and posting the pics to social media — the trio has sparked considerable outrage, particularly among the region's Mi'kmaq indigenous community. This moose was known to the local Mi'kmaq people for years, but they refrained from killing it because they consider all white animals to be sacred — what they call a "spirit animal." Even hunters, aside from these clowns, don't shoot albino animals for fear that it'll bring bad luck — and despite the fact that it's not illegal. These guys breached a kind of unwritten code of conduct that has also upset many in the hunting community. We know the significance and we've been teaching that to the non-native population for almost 500 years — about the importance that this and other white animals played in our lives. We are not to harm them in any way, shape, or form because they could be one of our ancestors coming to remind us of something significant that's going to happen within our communities. It was so disrespectful having seen it put on the social media, and it's been an outcry and our people are outraged. They didn’t realize the animal is a sacred symbol to the Mi’kmaq people and now efforts are being made to right the wrong. “The hunters are saying ‘we wouldn’t have shot the moose if we had known it meant that much,’” says Jim Hnatiuks, who owns a hunting and taxidermy store in Lantz, N.S. The hunters brought the moose to his store for mounting following a hunting trip in the Cape Breton Highlands. Hnatiuks says the hunters weren’t aware of the implications of killing the rare moose - a Spirit Moose to the Mi'kmaq people. “They thought they had a successful moose hunt. It was odd that they shot a white moose, but to find out wow, there’s a lot more behind it,” he says. nice/rare trophy, but why would anyone shoot it. I do not hunt moose or apply for a tag but if I did and saw that I would be taking pictures and letting it walk. but to each his own. losing an animal like that from the population was a screw up by the dnr. it should have been on the protected list with the mainland moose. Better keep these guys away from Australia's Queensland coast.